This will be the last teaser from A Clash of Kings as I should hopefully be finished reading it by the end of this week. Arya Stark continues to be one of my absolute favorite characters and I loved this particular exchange between her and Jaqen H'ghar. She had realized that the two names she'd whispered to the assassin before had been meaningless in the grand scheme of things and she wanted her last to truly mean something. This was a bold move by her and in a lot of ways changes the direction of her path yet again. Anyway, this has been an amazing book to read (really no surprise there) and I can't wait to get to the end of it so I can continue on to the next book in this incredible series! Leave me a link below and have a great Tuesday! I absolutely love Arya and that whole exchange with Jaqen H'ghar. That series is so good. I love fantasy too, but I just started reading this series back in April of this year. 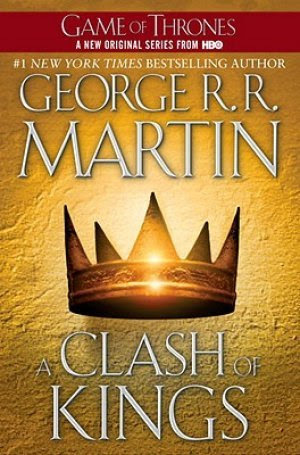 I had been watching the HBO series and just couldn't resist finally reading the books! Hope you get a chance to read them and thanks for stopping by!